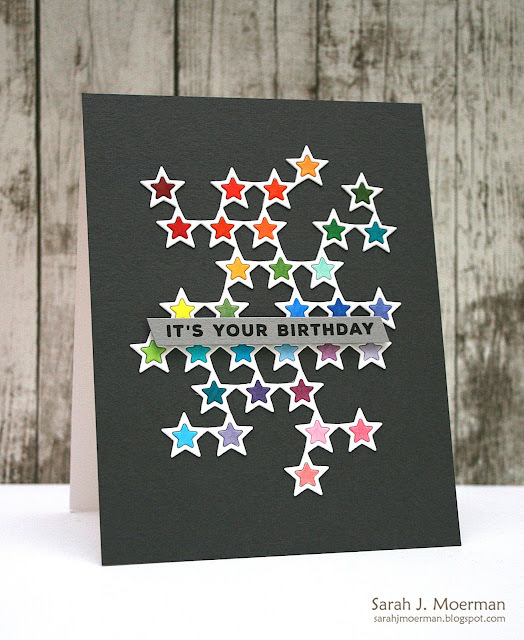 I'm stopping by today to share a card made using Simon's fun new Stacked Stars Die and a bunch of Copic Markers. I die cut the Stacked Stars Die from Neenah Solar White Cardstock and coloured the center pieces in with a rainbow of Copic Markers. I then pieced the diecut together on a panel of Simon's Slate Gray Cardstock. I stamped the sentiment from Simon's Big Birthday Wishes Stamp Set onto Smoke Cardstock and adhered it to the card with Foam Tape. Awesome card! I love the bright colors against the black background. Great job!! Fantastic card, I have everything to make this, so may give it a go. Love all the little colors! Love the clean and simple look of this. Stacked stars would be a nice addition to the August kit! Awesome card! I love that die!